Cut cauliflower into small pieces, boil water with salt and turmeric, then put cauliflower and boil for 5 minutes then remove excess water with the help of a strainer. Keep aside for 10 minutes till it cools down. 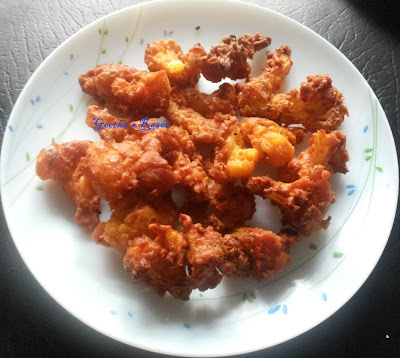 In a bowl add chilly powder, hing, rice flour, gram flour and little salt( cooked cauliflower already has salt so be careful while adding) and make thick paste. Coat this paste on the cooked cauliflower and keep aside for 5 to 10 minutes for marination and deep fry them. This can be served as a side dish or can be had as snack.